Despite significant headwinds, the Middle East has improved its T&T competitiveness. International arrivals continue to grow, reaching 72 million in 2015 compared to 68 million in 2013 and 62 million in 2011, when the region experienced its biggest drop in tourist arrivals. Better ICT infrastructure, lower prices, partial improvements in international openness and some progress in nurturing cultural heritage have created better conditions to develop the T&T sector overall. Still, natural and cultural resources remain mostly underexploited and international openness is still limited. To date, security perceptions remain the biggest hurdle for the T&T sector, preventing the region to achieve stronger growth. The terrorism incidence for 9 of the 15 countries in the region covered by this Report has increased in the 2013-2015 period. Similarly, perceptions related to terrorism have worsened for at least half of the countries in 2017 compared with two years ago, with the notable exceptions of Lebanon and Egypt, where perceptions have improved but still remain poor (128th and 133rd respectively). There are large discrepancies in the region, making the Middle East and North Africa the least homogeneous region. For example, while some countries rank low on security indicators, countries such as Oman, the United Arab Emirates, and Qatar rank among the 10 safest economies globally, with little terrorism incidence. 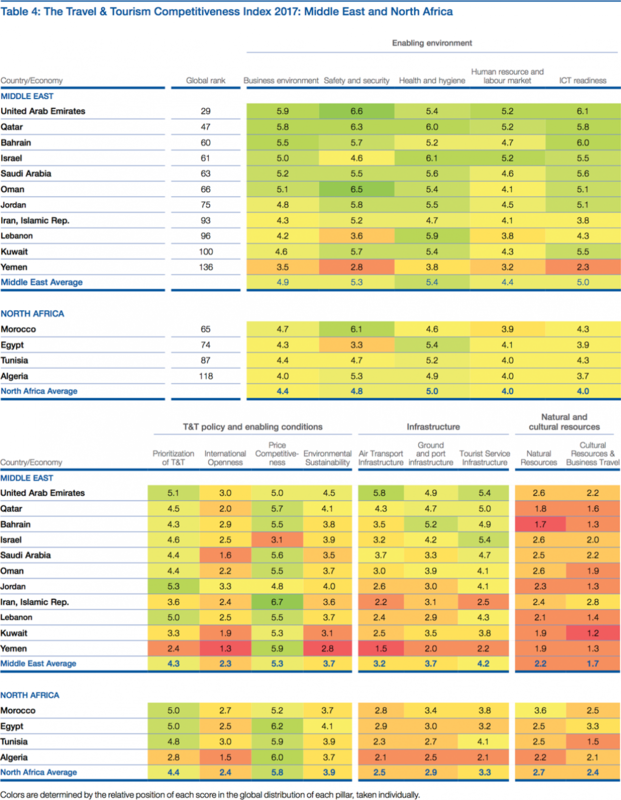 Similarly, there are stark differences on business environment, ICT readiness and the quality of infrastructure between the top five countries in the region (the United Arab Emirates, Qatar, Bahrain, Israel, and Saudi Arabia) that perform very well, and the other 10 less developed economies. 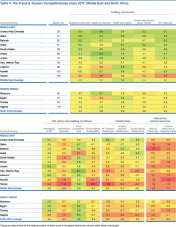 There are also significant variations in country performance across the region vis-à-vis the 2015 edition. Starting from different levels, Bahrain, Iran, Morocco and Algeria have all improved their security significantly, while Saudi Arabia has registered the largest regional improvement in health and hygiene. Similarly, while there are countries such as Egypt and Kuwait that have increased T&T sector prioritization, others, such as Qatar and Yemen, that have not. Even within areas where there has been an overall improvement, there are substantial differences in the region. For instance, Egypt, Oman, and, to a lesser extent, Saudi Arabia have upgraded their cultural resources significantly more than the regional average, while Bahrain and Tunisia have proceeded faster towards openness compared to the other countries in the area. Hopefully the region can continue to improve—despite the international security context—to be in a better position once stability is restored. The United Arab Emirates, ranked 29th globally, continues to be the most T&T competitive country in the region by far. Its performance continues to improve (rising 1.4% in score since 2015); the country welcomed 14.4 million international visitors in 2015, 4 million more than two years earlier. Despite these improvements, the country fell by a few positions in the rankings, due to exceptional performances of countries in other regions, in particular, South Korea and Greece. The United Arab Emirates continues to offer an outstanding business environment to invest in T&T activities (5th), with advanced ICT readiness (15th) and one of the best air transport infrastructures in the world (3rd), in terms of both connectivity and quality of the service. It is also one of the most secure destinations (2nd), and has a well-developed hospitality and entertainment infrastructure (27th). To improve its competitiveness further, the UAE should focus on becoming more open (75th), expanding its health facilities, and making better use of its natural resources (91st). While the UAE has significantly developed certain segments of cultural tourism, including international conferences and car racing, natural tourism remains an untapped resource for the country. Israel (61st) is one of the most improved economies this year, rising 11 places in the global rankings. Its performance can mostly be attributed to an improvement on contextual business conditions. The business environment (32nd, up 19 places) is becoming more open to competition and to foreign investment. Improvements in ground infrastructure (36th), especially ports, and in skills and labour regulations (21st) have also contributed to enhancing the business climate. The T&T sector is supported by sound tourism service infrastructure (26th) and widespread use of ICTs (32nd). Israel’s cultural resources (57th), including its nine World Heritage Cultural sites and several international association events, are a primary motivation to visit the country. Israel could further develop its natural tourism (93rd) to offer a diversified value proposition to all types of tourist. The main issues hindering Israel’s T&T development are the low level of security (103rd), especially related to terrorism risks, and the limited openness (99th), which is linked to efforts to limit threats to security. Egypt ranks 74th in this edition, gaining nine positions compared with two years ago. Egypt is still on the road to recovery. In 2015, it welcomed about 9 million international tourists, a figure that is higher than pre-financial crisis level, but still about 5 million short of its 2010 peak before the Arab Spring. The country has put in place better conditions to resume the growth that almost doubled the size of the sector between 2000 and 2010. In fact, the main drivers of Egypt’s performance have been greater increase in governmental support of the T&T sector (37th, up 32 places)—including the allocation of an impressive 6.8% of the total budget (22nd) to the sector—as well as the strengthening of cultural resources (22nd, up 19 places) to rebuild the country’s image. At the same time, an increased digital presence has led to a growth in digital demand for the country’s popular cultural resources. In addition, Egypt continues to be one of the world’s most price-competitive destinations (2nd) and has eased its visa policy substantially (51st). Still, security concerns, and terrorism in particular, remain the largest challenge (130th) for Egypt’s T&T sector. In the current context, Egypt is putting in place the right policies to enhance its competitiveness, which will certainly create translate into greater T&T development when the political situation stabilizes. Jordan is ranked 75th, and the country’s stable performance (up two places) should be lauded as a success given the regional context. Jordan has made remarkable strides in improving its ICT readiness (44th, up 21 places), through much broader use of mobile phone technologies, achieving the 5th and 19th highest mobile and broadband mobile subscriptions respectively. The nation has also managed to maintain a high level of security, ranking 38th globally, outperformed regionally only by the UAE, Oman, Qatar and Morocco. The impact of terrorism has been smaller compared to neighbouring countries, which has helped considerably in maintaining generally constant international tourism arrivals over the past four years. Jordan’s T&T competitiveness is also driven by high government prioritization (22nd), including the 6th highest relative spending. The country’s business environment (41st) supports the sector’s development through low administrative burden to obtain construction permits, well-protected property rights and market concentration. To further develop its T&T competitiveness, the nation should upgrade its air and ground transport infrastructure (69th and 79th, respectively) and focus on its natural and cultural resources, which remain substantially under-valued (117th and 118th, respectively). Tunisia falls eight places to take the 87th position on the 2017 index. Representing 14% of total exports for Tunisia, the T&T sector has great importance for the country’s overall economy, and is consequently highly prioritized by the government (48th). Tunisia has traditionally attracted tourism with its beach resorts, modern accommodation infrastructure and attractive prices. Price competitiveness remains strong (9th), and the country’s tourism sector infrastructure attains a fair performance (69th). However, natural resources (94th) are not sufficiently valued. To date, only one site appears on the UNESCO’s World Heritage Site list, and the digital demand for tourism related to nature is low (59th), indicating an insufficient value proposition. Both ground (95th) and air infrastructure (85th, down 8 places) are less efficient than they should be, with fewer companies flying directly to Tunisia, which leads to lower international arrivals. Yet the main bottlenecks to development are low safety and security (102nd), with terrorism emerging as a destabilizing force (112nd), which in turn has led to high costs on business (125th), and an extremely rigid and uncompetitive labour market (136th). As a result, international arrivals have reached their lowest point in the past 13 years, with a drop of 2 million visitors compared to 2014.